Grand Isle: The Louisiana coast features Grand Isle, a hot spot though out the year, and is the only barrier isle in Louisiana, and is very productive. Most fishermen wade fish the Gulf side of the isle with great results. However, the back side of the isle is loaded with marsh and some of the local fishermen never leave the marsh. It can be that productive. Kayaks can get into the water easily. They have built a new kayak launch on the back side of the island, I believe in 2015. You don't have the problem with trying to launch in the surf, which can be challenging. The majority of the fish are always found over the oyster beds, but finding these structures can be difficult if you have never been here. If you plan on making several trips here, hiring a guide the first time can be well worth the money. 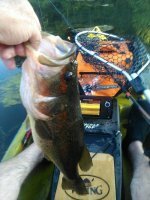 Even if your guide is in a boat instead of a kayak, you can be spotting many areas for kayak fishing. Elmers Island: For the experienced kayak fisherman, Elmers Island can be one of the best places to fish. When fishing on the Gulf side, if you are not experienced with this, be sure to take someone with you that has been there before. Fish the troughs between the sand bars or fan cast along the shore. Elmer's Island is less than a mile to the west of Grand Isle. When you get on the beach turn left and drive to you can't drive anymore. You can fish both sides of the island. Cocodrie: Cocodrie is a Lousiana French word that means Crocodile. Don't let that scare you, because Cocodrie is the place of legend for kayak fishermen. As the bird flies, it is about 30 miles from the edge of Grand Isle, but longer by car. It is a golden spot along the Louisiana coast and fishing Louisiana doesn't get better than this. It is loaded with marsh and holds lots of fish year around. You don't have to paddle far to get to some great fishing spots. Whether it is speckled trout or redfish, Cocodrie will make you go weak at the knees just hearing about the fish caught there. 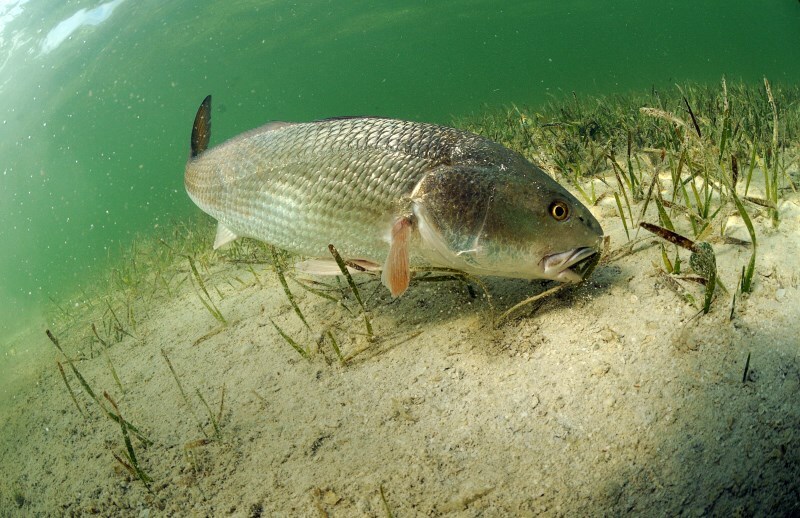 Topwater lures such as Heddon Super Spook Jr's, weedless spoons, soft plastics and more are used for redfish. Vudu Shrimp imitation lures are what I use a lot. Located at the end of Highway 56, deep in the Lousiana marsh, you can easily put in at the marina. Venice Louisana: Venice is situated along hwy 23 below New Orleans on the Louisiana coast. Fishing Louisiana doesn't get much better. It is well-known for its great off shore fishing as well as lots of marsh in skinny water for kayak fishing. It is known as the Redfish Capital of the World. You can catch some great redfish as well as specks, flounder and others. You can put in at many different places along the road or at marinas. Fantastic fishing can be found along along 23 from Buras to Venice. Many people fish the area called the "Wagon Wheel" also known as the "Dome", a name given by the oil industry. The shape looks like a wagon wheel. Many lures work in this area, including popping corks with an imitation shrimp attached below it. I often use an H and H popping cork which currently cost about $4.50 for a 2 pack for the 3" (Comes in 3, 4, 5 inch) and come in three colors. The Louisiana coast line is extremely familiar with popping corks and are easy to rig. The H and H model comes with a coated 30 lb wire leader. Here is a link to their lures. Pointe Aux Chenes: Pointe Aux Chenes is located south of Houma and Hwy 665. About the only place to put in would be the Pointe Aux Chenes Marina. There is a small fee. There are other spots on the end of Paw Paw Ct, such as Eddies Kayak Rentals, but I am not sure if you can launch there. Call ahead and ask. Pointe Aux Chenes locals will tell you it is the best place for Redfish on the entire Louisiana Coast. Whether it is true or not, it is definitely good. You can find redfish all year, but especially in spring and fall. The summer can hold a lot of trout as well. You cannot go wrong at this place. Choupique Bayou: Choupique, pronounced "Shoe-Pick", is back in my neck of the woods below Lake Charles, LA where I was born and raised. This is a little known spot except by locals, but Choupique Bayou can hold some good redfish and specks. To get there, turn south off highway 10 at exit 20 onto 1256. It turns into hwy 27. Go about 10 miles to Chilly Westlund Rd - Turn right and first road to the left is Hedin Rd. The end of the paved road is a boat ramp and farther down is the kayak launch. After putting in you can fish either side of the bridge on the bayou. If you go east under the bridge you can fish along the shore and are no farther than maybe a 100 yards to the first entrance into a marsh. This area is best fished at high tide and farther down are more inlets, ponds and canals into the marsh. These hold some surprisingly good fishing through most of the year. If you go west from putting in there are many canals that lead to openings in the marsh. Many small lakes can be found holding fish. You can't go wrong going either direction. Best lures are to start with are topwaters, popping corks and shrimp imitations as well as weedless spoons. There are many other great places for fishing Louisiana besides these. This is certainly not an exhaustive list. The beaches off Cameron, as well as Calcasieu Lake and Calcasieu River, West Lake, the areas around Pelican Island, Cyeremont Point, Lake Pontchartrain, and others are famous for fishing as well. If you are a bass fisherman, Louisiana is not called a Sportsman's Paradise for nothing. Numerous rivers, lakes and canals hold bass, catfish, and more. It is possible to catch largemouth bass and redfish in the same locations where freshwater and saltwater, called brackish water, meet. Adam Fisk, a pro kayak fisherman, made history by catching the largest marlin over caught from a kayak. This is amazing! Check out the video! Fishing Louisiana Coast and Marshes are the best in the world. Find out where the hot spots are.